Valiant's crossover event HARBINGER WARS 2 is off to a tense start. Everyone is after Livewire and unless her demands are met she's not budging. The stars of Valiant merge into one explosive series that could change everything. Any major comic book event needs high stakes and a universe-shaking outcome. 'Harbinger Wars 2' simmers with tension and promises to be that kind of event when the battle lines are drawn. The government is rounding up psiots, children in particular, and Livewire has destroyed the U.S. power grid, disabling satellites, causing a nationwide blackout in retaliation. She won't let up until the capture and torture of psiots have ceased. She's been hiding refuge psiots while Peter Stanchek has been activating psiots across continents ensuring reinforcements. The government is fighting back with a group of Valiant heroes of their own and this is the conflict at the heart of Harbinger Wars. This is all typical stuff for publishers who pit their stable of heroes against government forces in a fight to free themselves from unfair subjugation. Marvel's X-Men is famous for these kinds of events and while this might seem overly familiar, writer Matt Kindt finds the soul of the story in the relationships between these different heroes. Their motivations differ but they all believe they're doing the right thing. Livewire has been shepherding and protecting discarded psiots for a long time so her stance here is totally within her character. So are the characters of X-O Manowar, Ninjak, Bloodshot, and the Renegades. These conflicting ideologies come from the heart but have put themselves on opposing sides with the fate of psiots in the middle. Tomas Giorello and Diego Rodriguez treat this series like the epic event it is. They create a noirish atmosphere full of shadows and dramatic imposing panels. Giorello uses some pretty big panels to center the introductions of each hero and they are impressive. Rodriguez's colors are dark but indicative of each character's signature color scheme. There's little action so far but the art team is primed to get it on soon. 'Harbinger Wars 2' takes the best aspects of publisher-wide crossover events grounding it in emotion and real-world parallels amid a brewing conflict. Valiant delivers the best action in comics and this series promises more blockbuster confrontations with universe-shaking consequences. This is accessible to new fans and lights the fuse to one explosive impending battle. 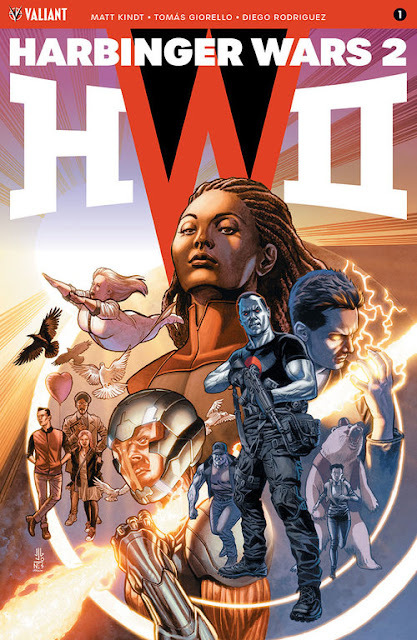 'Harbinger Wars 2' is a must-buy.